R:.W:. 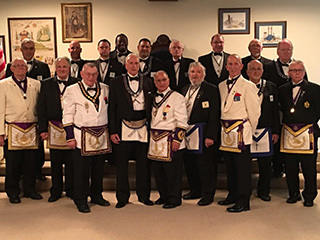 Charles P Uhle was installed as Master of Wappingers Lodge #671 for the 2016-17 year. Along with several Past Masters, Brothers, family members and friends, the public ceremony was attended by Grand Lodge Officers R:.W:. Richard S. Morley, Senior Grand Warden and R:W:. Nicholas J. Paolicelli, Junior Grand Warden, R:.W:. Arthur H Pritchard Jr., District Deputy Grand Master, R:.W:. Clinton E. Allen Jr., Grand Stewart, R:.W:. Richard Hawthorne, Assistant Grand Lecturer, and R:.W:. Robert L Hogan Jr., North Star District Chairman.